and its simplicity and a segway to the Great Room with tones of gray and silver. Noble Fir, Juniper, Incense Cedar and Salal leaf. to be beautifully more fragrant and last longer. So step into my Great Room all decked for Christmas! The first thing you will see is the mantel. and assorted greenery and faux evergreen swags at each end. some pretty seeded eucalyptus and baby’s breath. I used to use baby’s breath in my fresh trees long ago. That was back when my friend in Florida owned a florist shop and I received a great discount! The tree looked like it had little puffs of snow on it. a while ago and thought they would be perfect for the garland. 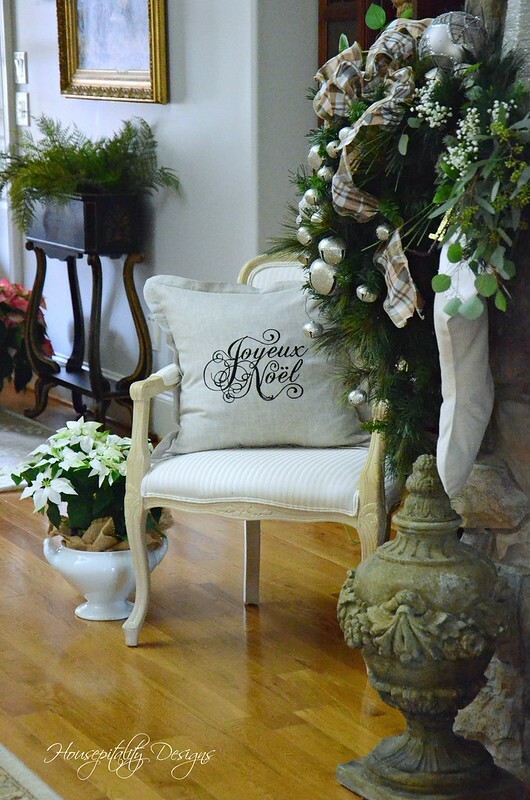 was love at first sight!…and perfect for the Christmas Great Room. I tried to keep the “mantelscape” simple having the garland be the star! (found recently at an estate sale) with an ivy wreath. it still represents eternity as it has no beginning and no end ….an unending circle of life. 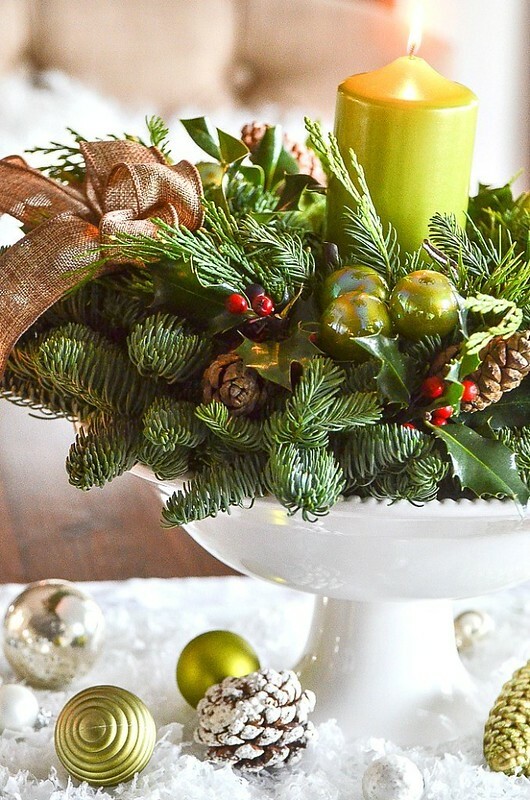 The evergreen in a Christmas wreath symbolizes growth and everlasting life. Did you spy a beautiful arrangement on the coffee table? It is the Snowberry Glow arrangement from Lynch Creek Farm. I chose the very same arrangement last year. Does that mean I love it so?!! Actually other than for its beauty, I love that this arrangement comes in a florist container. That way I can easily slip it into the container of my choice….however it looks fabulous as is!! I used my treasured blue and white container that was gifted to me by an old friend and colleague. She was so excited to give this to me and so was I! I have had this for way too many years that I would want to admit! It was an antique of her family’s and she knew that I would love and cherish it and I do! See the jeweled “JOY” pillow on the chair? Happy memories. I get feelings of joy whenever I see that blue and white beauty! The Christmas trees are in the back corner of the great room. You can see more detail if you would like of these Christmas Trees. by clicking on the highlighted words. I purposely did not add any Christmas decor to the bookcases. Since the mantel was a bit dramatic in the middle of this wall, I thought less is more. Did I just say that?!!! Just simple little vignettes like this one on the table between the sofa and chair. that was formerly in the master bedroom. 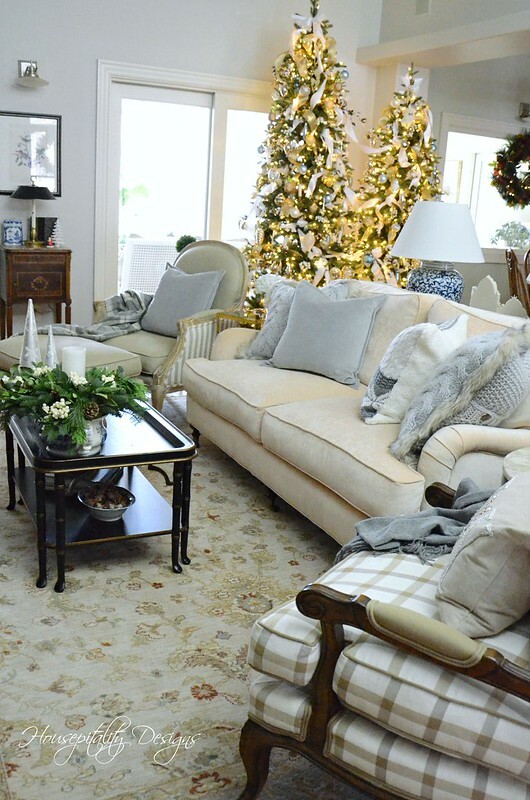 So the soft grays in the pillows and my Silver Bells Mantel fit the bill. All of the pillows on the sofa are from Pottery Barn. I am still working on that room; however, it shall be simply decorated for sure! I surely hope that you enjoyed my Christmas Great Room at the Berry Patch house today. I am really loving the mantel this year and the soft colors of the room. with free shipping within the Continental U.S.
leave me a comment telling me what your personal favorite ornament is! The deadline for this giveaway is Midnight (EST) Saturday, December 8th, 2018.
in notifying the winner so that their wreath may be shipped in a timely fashion to enjoy for the Holidays! This giveaway is limited to residents of the Continental U.S. only. and you can comment (as directed) on their posts. Note: Lynch Creek Farm provided me the beautiful wreath and arrangement. All glorious reviews of these products are joyfully and happily my own!!! Absolutely wonderful, Shirley. It looks like you’ve been settled in Berry Patch for years, not just months! Truly, it’s incredible what you’ve done to the place. The Lynch Creek Farms arrangement and wreath are perfect, and I will love to participate in the opportunity you’ve made possible – thank you! My favorite ornaments are the Wallace candy canes issued each year. My sister has one for every year since their inaugural year (1981). She & her husband started gifting one to my husband and I every year since 2003, when we started hosting our family Christmas. They are the first ornaments I put on the tree each year, and I love unboxing them. This is the first time I have visited your site, and I’m glad I did! Your home is beautifully decorated. I love the simplicity. Yay for the giveaway! 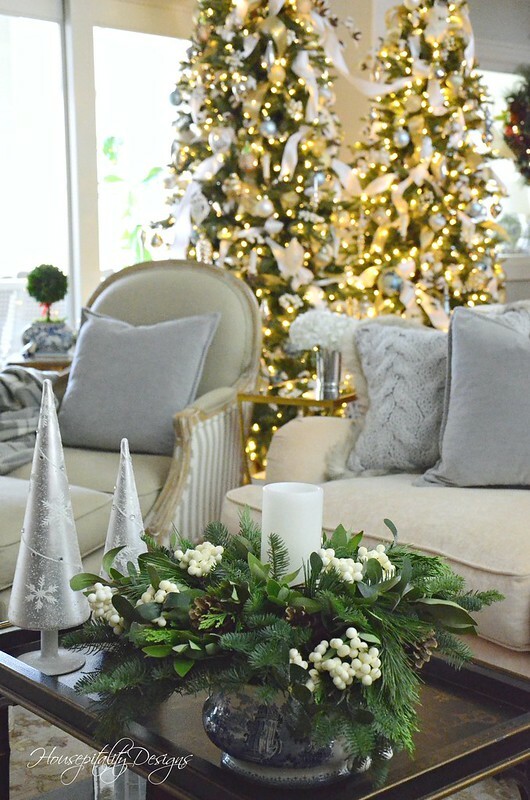 I love that beautiful embellished garland on the mantel and that oh, so pretty arrangement on the coffee table. My centerpiece I got last year from Lynch Creek Farm lasted forever and the garland lasted a long time, too. Wow! All your florals and greenery look wonderful. My favorite ornament is anything from the 12 Days of Christmas as this is only what I decorate in. I love your partridge. Any idea where you bought this? I bought it at a local shop many years ago…they are from the company Raz. I have been collecting ornaments since the early 1970s and have almost a thousand, so it’s hard to say which is my favorite, but I guess I would have to say my blown glass angel from Germany. I still buy ornaments if I find something that catches my eye! 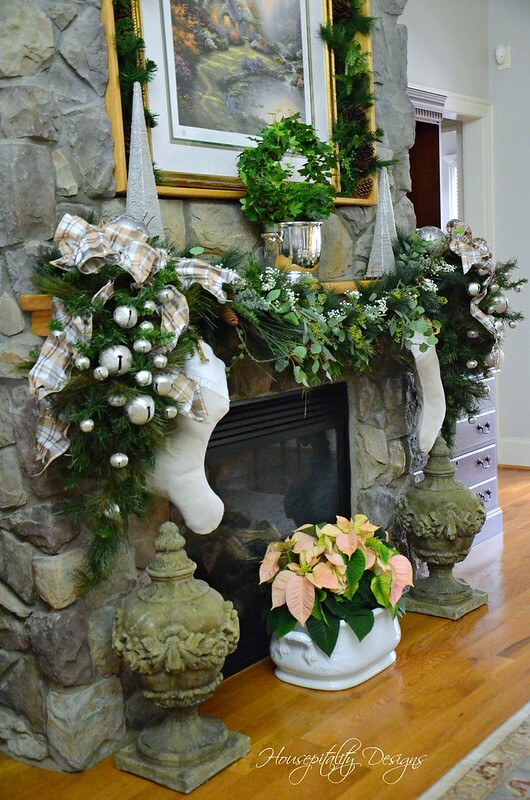 Your home is gorgeous…..I LOVE the swags and garland on your mantle this year! Thanks for sharing your lovely home! 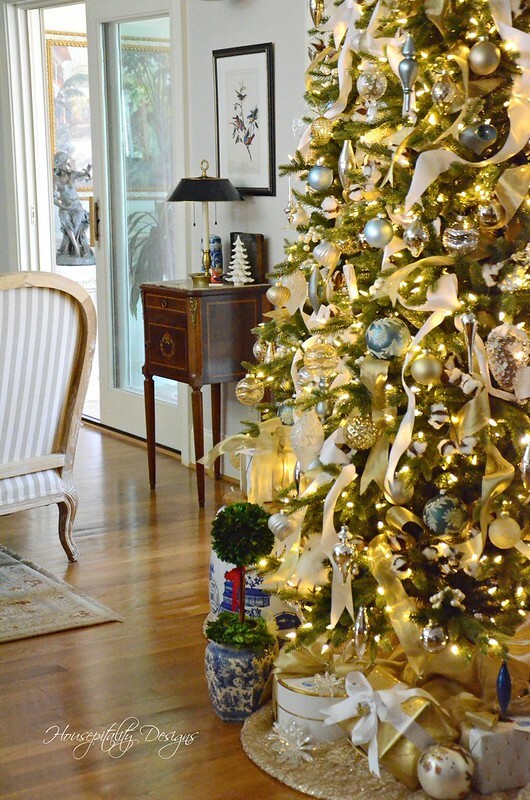 You always amaze me with your stunning rooms, and your Christmas great room is gorgeous! I have never had the opportunity to use Lynch Creek Farms as of yet, but their greenery is simply beautiful. 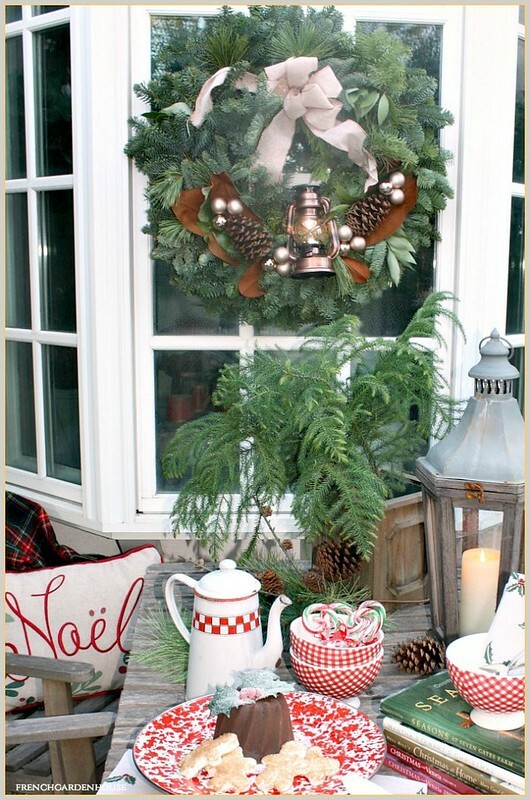 I absolutely love the Bronze Magnolia wreath, it is so pretty and would be so inviting to all my holiday guests. My favorite ornaments are the ones my son made each year at school throughout his childhood. He is grown now and embarrassed to see these “blasts from the past”, but I love them! 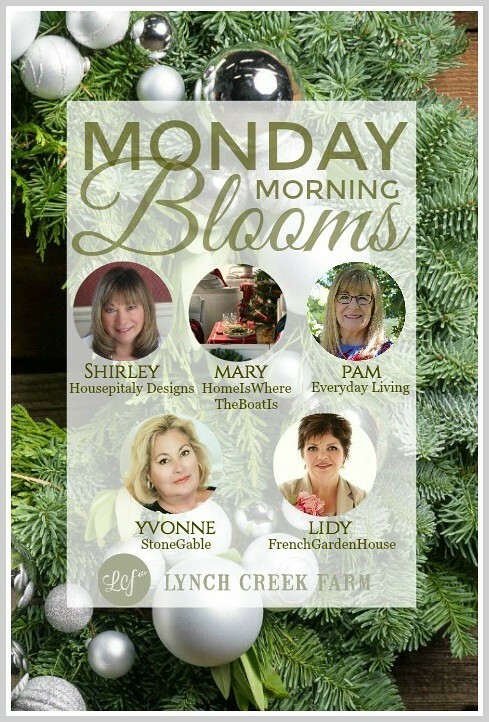 I would love to win the giveaway as anything from Lynch Creek Farms is gorgeous! I cannot pick one thing, your home is beautiful, your decor amazing! How beautiful your room is! I have a blown glass French rooster that I love. Don’t enter me in this giveaway, because I just won a Lynch Creek Farm wreath on another blog and I want others to have a chance. 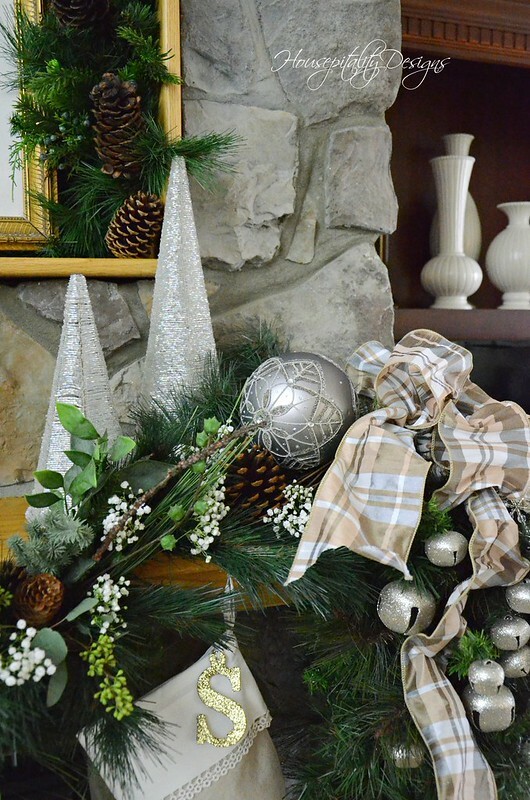 I just love your theme for that mantel and the silver bells ornaments really are a showstopper! Your decorations are exquisite! I love neutral colors with whites and greens. My fav ornaments are the ones made by my children when they were young. They are both grown and live out of town. Having those ornaments are very special to me. Thanks for a fun giveaway! Your home is so inviting. Love all the Christmas decor. Our 2nd child came on Christmas Day and I have always decorated for him as well as Christmas. I will definitely be checking Lynch Farms! Love Love Love the mantel it’s beautiful!! Never had a live wreath would love to win!! Shirley it’s amazing how you keep outdoing yourself! Your great room is spectacular! I guess my favorite ornaments are the ones I’ve had since I was a kid and inherited them from my mother. They bring back so many memories every year when I unpack them and hang them on the tree. Beautiful! Don’t know where you get the energy. My favorite ornaments are the original ones we had when we were poor college students. Live your beautiful mantle. Personally, my favorite ornament is a tree topper that my youngest daughter made years ago It always brings a smile to me. So glad you ladies are doing this! A give away and more bloggers to follow! Without a doubt, my favorite ornament is a homemade globe with my infant daughter’s handprints on her first Christmas. My favorite ornament is an ornament I bought 23 years ago that says “our first Christmas together” and has a picture of my husband and I.
Wow, your home is beautiful! 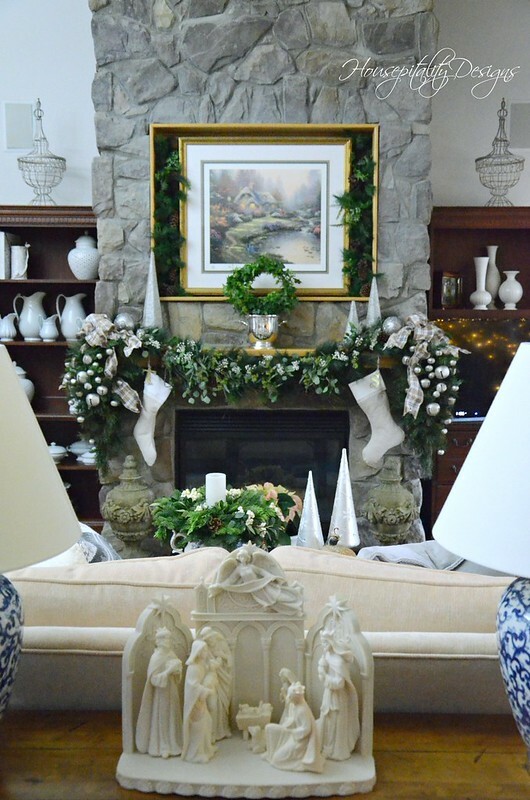 I love the silver bells and how you decorated the mantel – absolutely stunning! There are so many ornaments that I hold very dear, however the ones that are most precious are the glass ones from when I was growing up. They are very fragile, with colors that have muted over the years and have a beautiful patina to them. I no longer put them on the tree but do bring them out to display in a glass container and reminisce about those long ago Christmas’s. I love the simplicity of your design! It’s just elegant! I love ornaments that are Old World. Your mantle and Christmas decorations are just lovely. 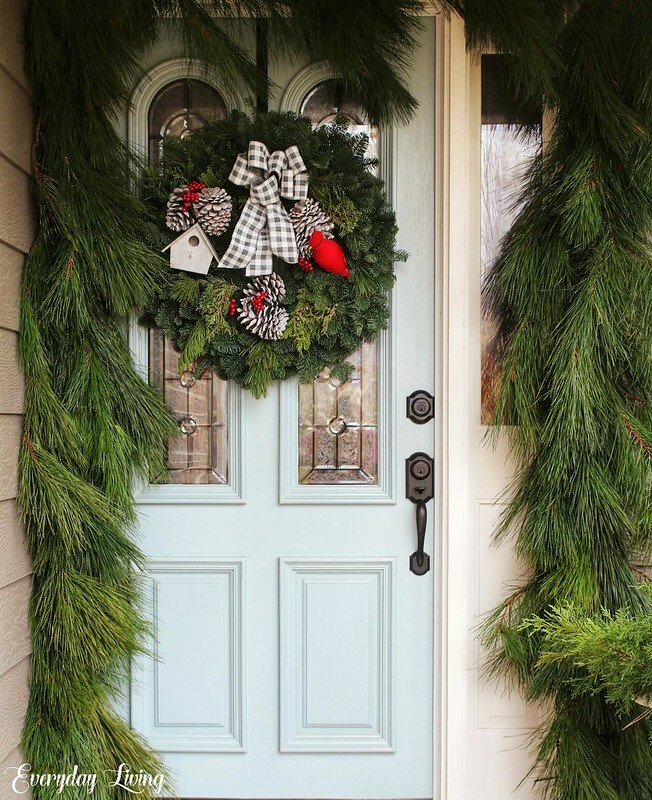 Would love to have one of the beautiful Christmas wreaths to grace my front door in eastern NC. Shirley, your mantel truly has me swooning, it is Gorgeous! I love the white and soft neutrals paired with lush greenery, and silver sparkles. 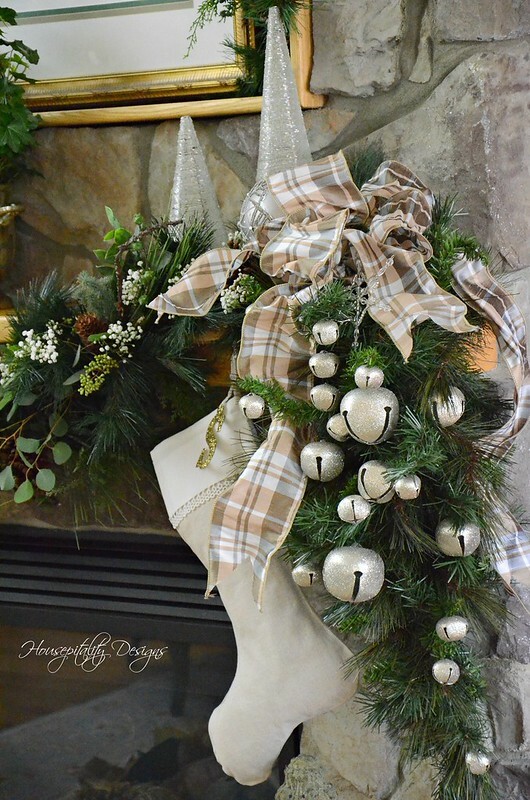 What a great idea to tuck in a few real elements to elevate the faux garland, it is so stunning, and I love the fat swags full of silver bells cascading down from each end! As for a favorite ornament, I can’t really say that I have one, but every year the children’s homemade ornaments go on our tree along with the fancy shiny ones, and our tree is a visual memory family album…Thank you for the eye candy and the giveaway! OOOOOOOOO Shirley, your mantel is to die for. I love the silver bells. I bet many an angel got their wings the day you decorated your mantel. Just beautiful. Can’t say that I have one favorite Christmas ornament because I have a Christmas Travel Tree. I try and collect an ornament from everyplace we travel. I got a new tree this year and it was like walking down memory lane placing the ornaments on the new tree. So my ornaments from all over are my favorites. Thanks for the giveaway and I hope I win one of these lovely wreaths. What is there left to say – absolutely beautiful as always Shirley. I love that table arrangement too! And this is your ‘in-between’ home? You sure have made it look great. My favorite ornaments have to be the ones that speak to the real reason for Christmas – nativity ornaments and angels come to mind. Not sure I have a single favorite. I love the subtle color that you used in your decor. My favorite ornament is a Popsicle reindeer head my son made in kindergarten. I have a particular love for nativities– yours here is exquisite! I would love to know where you found it. Thanks for the opportunity on the beautiful greenery. I have not yet decorated due to family illness, and would love to add it in. I love, love, love the pinecone pillow!! I think one of my favorite ornaments is one my then 15 yr old brother bought me. It is a delicate setting of the creche scene of the Holy Family in a barn setting. It was over 30 yrs ago but the fact that he gave it to me meant a lot and still does. Shirley your mantle looks fabulous. Since our great room is attached to other rooms I left a few of them with simple touches as you did. You are the Queen of Floral. As stated above in comments….Just Beautiful!! Simple, Classic, and Elegance! You decorate so pretty! This could be a forever home? Not Berry Patch? Truly love all your beautiful decorations! The mantle is just exquisite! My favorite ornament is a gold teddy bear engraved for my husband from our son’s first Christmas in 1976. Always look forward to your blog posts! Oh how I love the addition of baby’s breath and seeded eucalyptus to your mantel garland. Absolutely gorgeous,! As always everything that you have done is spectacular. The blue and white container on coffee table is just one of the prettiest pieces I have ever seen. Always a pleasure to see your beautiful decorating. What a beautiful room this year…the plaid ribbon is so unique. My favorite ornament is my late father’s small colorful glass train. He was from a railroading family…my grandfather, great-grandfather, etc. Over the years, I gifted him with many train ornaments. I look forward to sharing this collection with my two grandsons..
Shirley, your great room is absolutely beautiful! The colors remind me of a winter wonderland. The silver luxe wreath, which I would love to win, would only enhance that feeling! It is impossible for me to pick a favorite ornament as so many have very special meanings…whether given to me by a dear friend or made by my mother or by my sons when they were small. I am so impressed with your decorating and how quickly you make everything so beautiful. My favorite ornament is a 1974 Betsey Clark Hallmark Ornament. My husband of almost a year gave it to me. I had seen it at a Hinkle’s Book store in Winston Salem. I was in my first year of teaching and he was a grad student at Wake Forest and our budget covered just the basics so I was excited to get this beautiful ornament from him. We have continued to get a Hallmark ornament each year plus every where we visit we always find an ornament from that place. We have more expensive and elaborate ornaments than that first one but it always has a place of honor on our tree and in our hearts. Wow! What everyday elegance in your home. My personal favorite ornament is the star atop our tree. It was my grandfather’s. It adorned the top of my grandparents’ tree, then my parent’s, and now mine and my family’s. We cherish it, keeping it in my jewelry box until December of each year. One of my favorite ornaments is a painted and glittered Christmas ball from my parents first Christmas tree in 1946. If ornaments could talk……. Everything looks lovely here. I need desperate help with my mantle, so I’m going to take some of your ideas and see if I can incorporate them into my home. Thanks for the giveaway. Lovely as always Shirley! The mantel is a wonderful focal point. I enjoy decorating for Christmas but it seems to take me longer each year. My favorite ornaments are the handmade ones our daughters made years ago! A milk carton sled is a particular favorite and this is the 36th year it has hung on our tree! Your mantle is just killer!!! And that ribbon is so perfect with your decor. Especially the chairs. Your space is so festive and gorgeous it will be a wonderful backdrop for all your holiday festivities! First time visitor to your site, and I’m hooked! I love the subtle tones with which you have decorated: silver, white, taupe. Very classy. My absolute favorite ornament is a little decoration my son made in Cub Scouts 35 years ago. It is a little baked clay bird with red tail feathers. It is glued on a clip clothespin. It doesn’t go with any theme I’ve ever had, but it elicits the most emotion! It always hides in my Christmas tree. I love all of your Christmas decorations! They are all simply lovely! ornament of each of our 5 grandsons. I am new here and I am in awe already….everything is just beautiful! My favorite ornament is a beautiful 50’s mercury glass ornament that was on my Christmas tree when I was a little girl. A few years back my mom gave me an old ornament and told me it was the first one she and my dad bought when they married.71 years ago. That is my favorite ornament. I so enjoy your posts and can’t wait to see how you decorate your new home. My favorite ornaments are actually three small matching ornaments that are the only things I have from my childhood Christmas. Hope my daughter will cherish these one day too! Shirley, you have such a gift for decorating. Your (temporary) home looks beautiful!! I would have to say that my favorite ornaments are my hand blown ornaments that I started collecting when we were in Germany. I absolutely love your centerpiece in the blue and white bowl. It is gorgeous. Thank you for sharing, I always walk away from your posts with inspiration. Really all of my Old World ornaments are my favorite, because each one was chosen with my children as they were growing up. Each one evokes a special memory for me. I hope to one day to continue this tradition with my grandchildren. Your mantel is simply stunning! All of our hand-made ornaments made by our children throughout their elementary school years, ornaments exchanged with fellow co-workers and ornaments specifically purchased for each of our children yearly that make up our “Memory Tree” are our favorites. I picked the Snowberry Glow centerpiece before realizing that it is the one you used also. Your home is so beautifully decorated. It has given me a few good ideas. My tree is decorated in all Santa ornaments. I purchase the ornaments as souvenirs when we travel so I get to relive the trips as I decorate the tree. My favorite ornament is a little space ship piloted by Santa. When you press a button there is a countdown, followed by the sound of liftoff and a voice saying “Merry Christmas, Houston.” I paid a dollar for it in Saranac Lake, NYand don’t know why it amuses me so but it does. I love that fireplace and what how you decorated it! 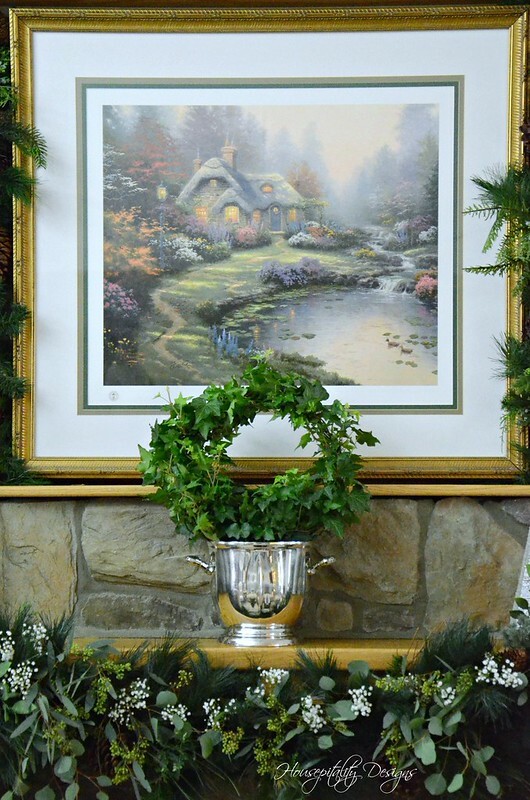 The silver bells looks so elegant dripping down the side of your fireplace and I love the Thomas Kinkade print. I just want to jump in and live inside his paintings! I’m loving all the different decorating styles from you and the others. I love all my ornaments that hold photos of my loved ones. As a favorite I would pick the one my Mom crocheted and put a photo of our first dog inside the center of it. Have a fantastic week! So lovely, Shirley! Your entire room is elegant and I love the soft colors. That ribbon is stunning. Your giveaway is very nice. 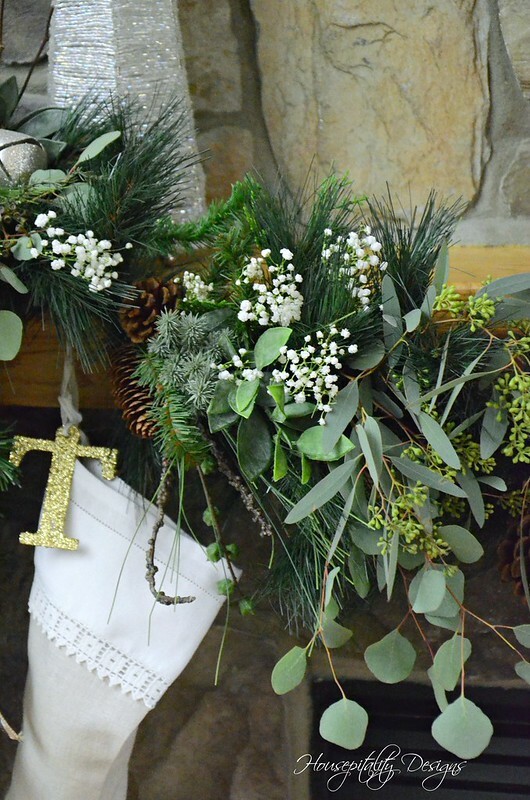 I love fresh greenery and the wreath and centerpiece are beautiful. I love all my ornaments collected through the years. But I my favorite is the little Radco church my daughter gave me when she really could not afford it. My grandfather dies on Christmas eve when my father was 5. For several years my grandmother would not put up a Christmas tree. When my father was a teenager he got a job in the coal mines and bought ornaments so that he and his little sister could have a Christmas tree. My aunt and my father have passed but my aunt gave me the ornaments before she died………they are very special to me. My favorite is the Silent Night ornament that belonged to my grandmother. I love sticking little bunches of baby’s breath, tied with plaid ribbon in my tree too. I have so many treasured ornaments and I put up a Christmas tree of some type in just about every room in my home in order to display them each year. Most of them have a theme. We have some ornaments our parents gave us on our 1st Christmas together as a married couple Hat are the first to get hung on our tree in our living room. Lynch Creek’s greenery is so beautiful and would be a lovely addition to our decor. Thank you for sponsoring this giveaway. Shirley, your great room is gorgeous adorned for Christmas! Your mantel is absolutely stunning!!! My favorite ornaments are the ones my children made when they were little…such happy and sweet memories. Enjoy your week!!! You have made your temporary home so comfortable and “holiday” cozy! My favorite ornaments are the ones saved from childhood. They evoke such memories of my siblings and parents who have passed on. That mantel is a showpiece! I loved the blue, white & silver in your room. My favorite ornament is a little 2 inch glass Santa that my parents had on their first Christmas tree. Mom gave it to me when I got married. They will celebrated their 71st anniversary in April, so that makes the ornament 71 years old! Everything looks so beautiful—I honestly can’t believe that you’ve been in your Berry Patch house less than a year! My favorite ornament is one that was purchased for me when I was a baby—a fun, whimsical glass bird. Very 1950s, and it always gets the spot front-and-Center. Shirley, no one could make a temporary home as beautiful as you have. The great room is stunning as you have dressed it so perfectly. The mantel is truly a showstopper with the lovely ribbon you found in Florida and the addition of seeded eucalyptus and baby’s breath. 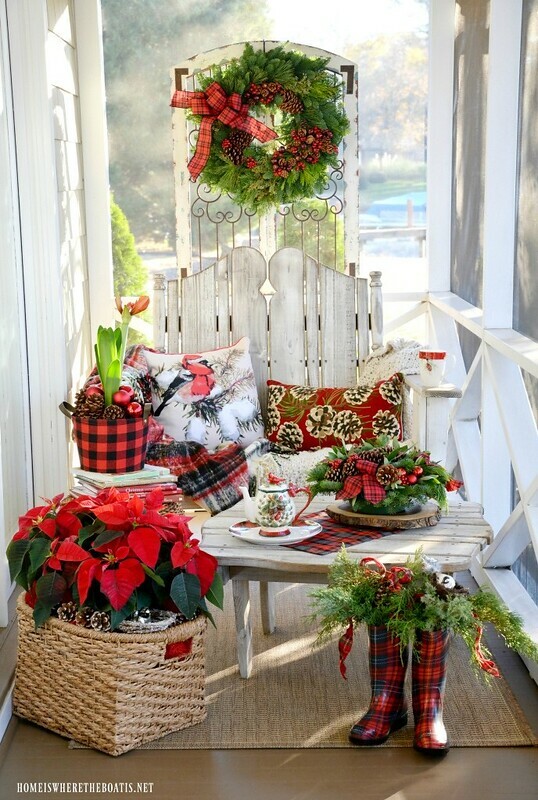 Each little vignette speaks of the peacefulness of this season. 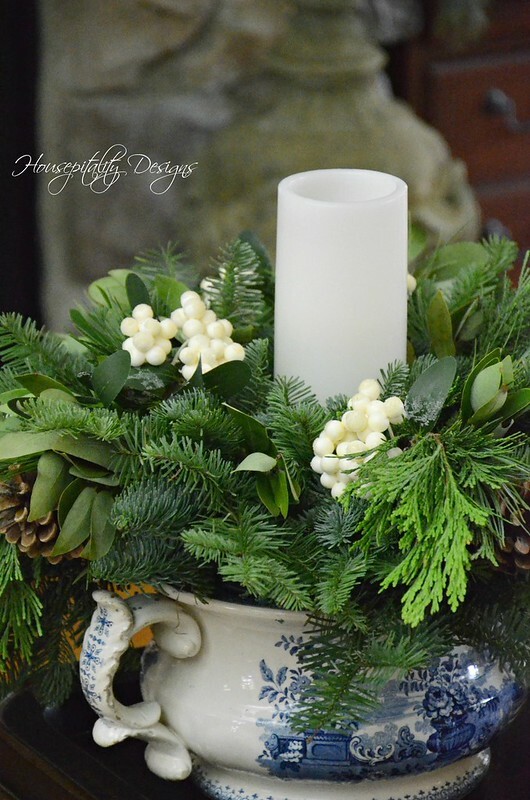 The snowberry centerpiece tucked in the the blue and white is gorgeous. I am amazed at your energy dear friend and thank you for organizing this beautiful tour. This home, I am sure, has never been more beautiful! I’m a first time visitor to your site. Your home is gorgeous. 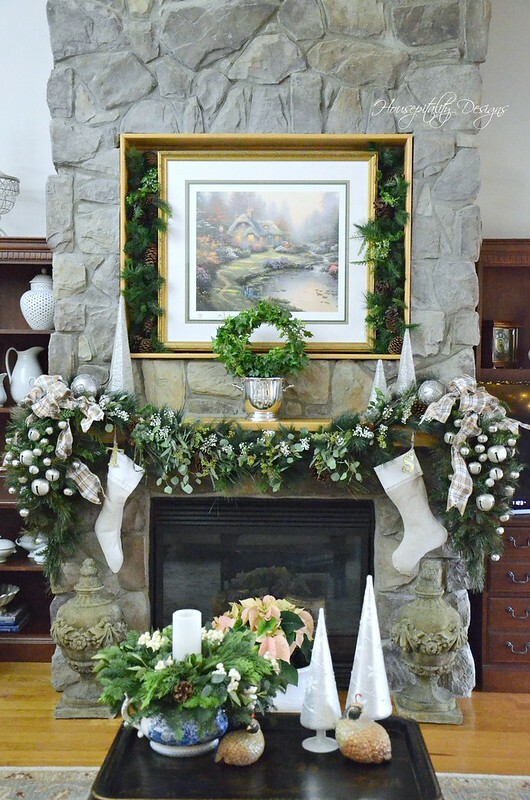 The garland on the fireplace is definitely swoon worthy and inspiring. You have some sweet and simple ideas to enhance a home that are adaptable to my home’s style. Thank you for sharing. Your home is gorgeous; what a neat way to start the day! First time I have been on your Blog and so glad I found it! 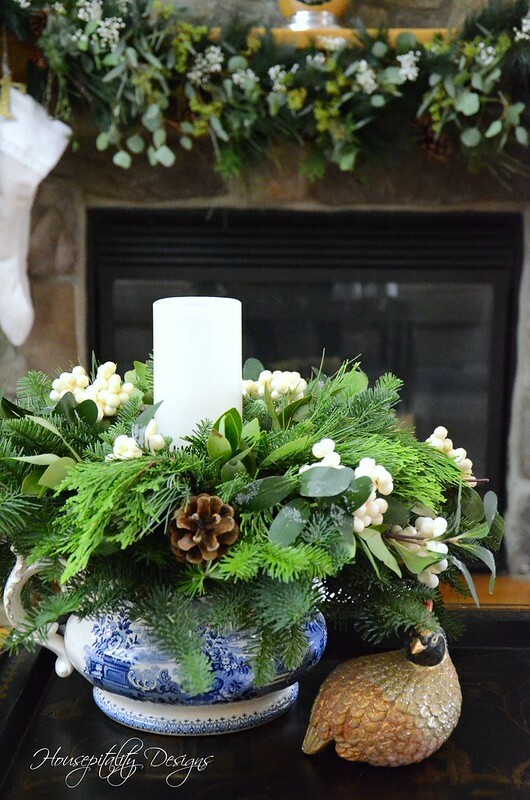 I love the way you incorporated the real eucalyptus in your mantel piece and th bells! It is hard for me to say what my favorite ornament would be; I love Christmas and everything that goes with it! Your home is simply lovely. I would have to say my favorite ornament is one that be longed to my Grandmother. Elegant Fireplace, lovely and soft bows!! Love it. My favorite ornament is a small Red Santa. He hung on my family tree from the early 50″s. About 4 years ago, he fell to my new wooden floor and the hanging stem broke. My heart was filled with sorrow. But I turned it around the next year and placed him in a small red sleigh that my mother bought for me when I first married. Along with other old ornaments he sits. So many fond memories of Christmas he holds. My first time visiting your site. It is lovely. So elegant. I’m glad you’ve added Yvonne to your tour. I follow her and always enjoy what she shares. My favorite ornament/s are all the vintage ones I’ve saved from my childhood trees. My parents did different themed trees for many years then finally did a collection of everything they had. I love them. I do favor an ornament my parents brought me back from a trip they took. It is a jeweled butterfly and though it is not a vintage glass ornament I treasure it as both of my parents have passed. My favorite ornament is a ballerina that my grandmother gave me when I was a little girl. It has hung on every Christmas tree since I was 5 years old! What a brilliant idea of adding swags to your mantel garland. Your room is very beautiful!! 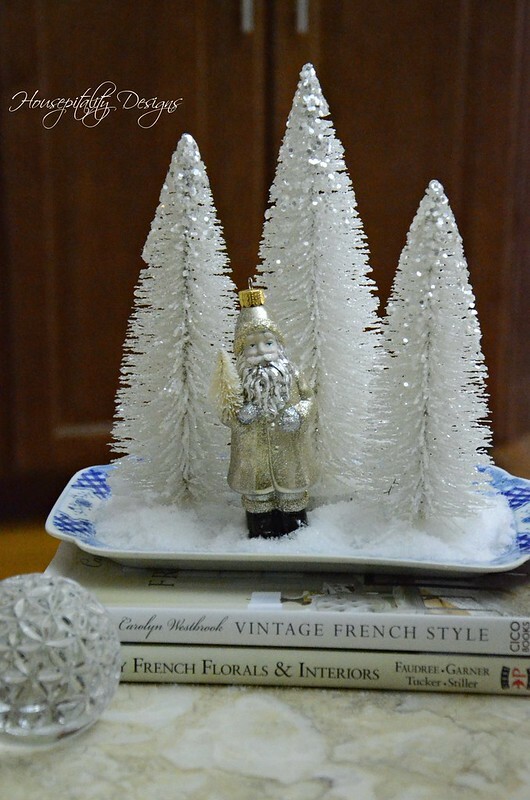 I have so many favourite ornaments, old world, snowflakes, reflector are my most treasured. A few years ago I recreated the tree my mother had when I was a child with all the shiny brite and reflector ornaments. I scoured antique stores and finally got enough for a tree of my own. Love your color scheme, your home feels very inviting. My personal favorite ornament are the little woodland animals like foxes and deer that are made out of natural materials. My favorite ornament is a glass bell that my mother hand painted on. Oh my! A pair of very talented hands and an eye for design are your special gifts indeed! The fireplace alone has texture, pattern, and color that makes it…sparkle perfect. My favorite ornament is a snowflake my mother crocheted many years ago. It no longer is white and sadly outdated but every year it is hung through tears with Love and honor. ..Mom lived with Alzheimer’s disease for 10 yrs. loved Christmas and would sing bits and pieces of Christmas songs as long as she could….so for now that sad looking little snowflake remains up front. For me! Darlene, I recently washed and re-starched the set of tatted snowflakes that my great grandmother made. They are now white and sparkly and look ever so much better. My favorite ornament is my very first one – a brass rocking horse from the year I was born. My favorite ornament is a Belsnickle Santa dressed in blue. Your mantle decorations are lovel. I especially like the silver bells. Merry Christmas! I love the Our First Christmas ornament we bought during our Charleston honeymoon 28 years ago. 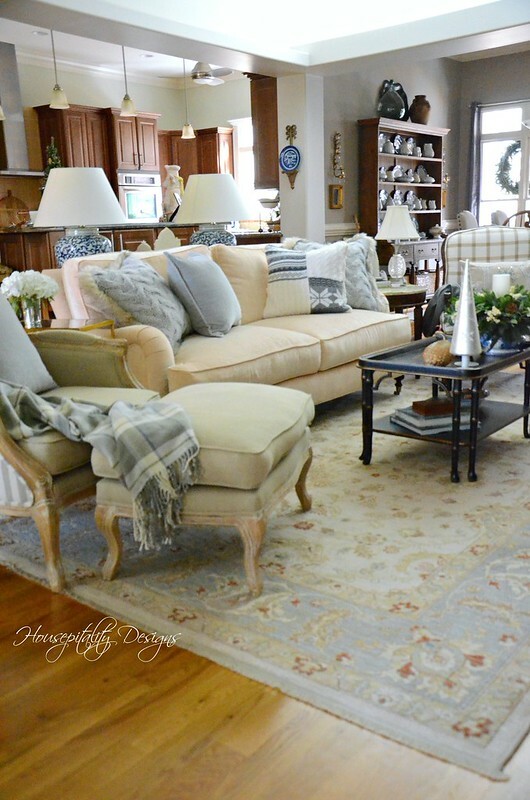 This is my first time to visit your blog and that gorgeous mantel is a show stopper. Thank you for sharing the beauty of your home. I love decorating with baby’s breath too! I love the neutral colors of this wreath. My favorite ornament is from my grandmothers tree, I used to help her put up. Ny favorite ornament is our first Christmas one that is the precious moments little people. It still makes me smile after 30 years! I’d love one of those beautiful wreaths!! My very favorite ornament is a simple green crochet wreath with a mini gold bell my grandmother made for me. She included my picture in it which I received as a toddler. My grandmother has passed so I now keep her picture in it. Your mantel is simply gorgeous. Your home is just gorgeous! I love Christmas and have been collecting ornaments from Hallmark for almost 40 years now but my favorite ornament to use each year is still my son’s first little pair of red mittens. They appear on my tree every year. 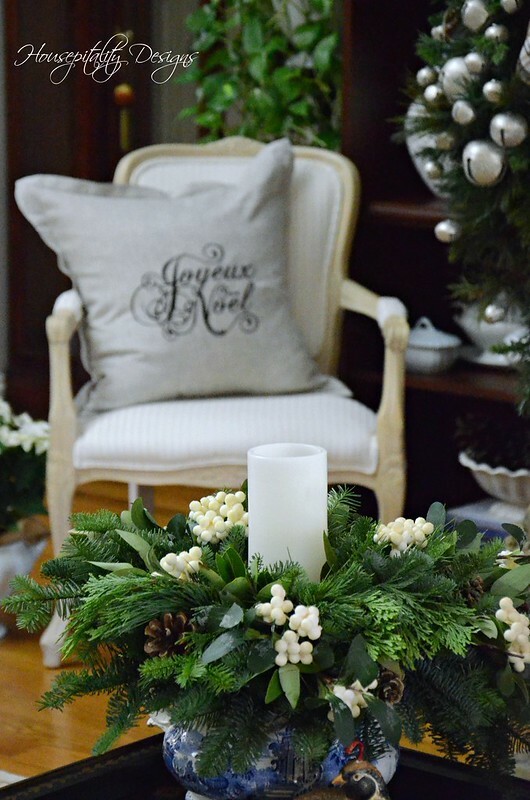 Love the silver urn with the boxwood wreath! Very elegant. My favorite ornaments are a set of vintage felt and sequin wise men and their mounts (camel and horse). I spotted them in a box of other Christmas stuff at an estate sale. I had to buy the whole box of junk to get those beautifully designed and sewn ornaments! I imagine the whole nativity was made, but apparently Mary, Joseph, and Baby Jesus were bequeathed to family members or sold in another box. Your home is simply stunning ! 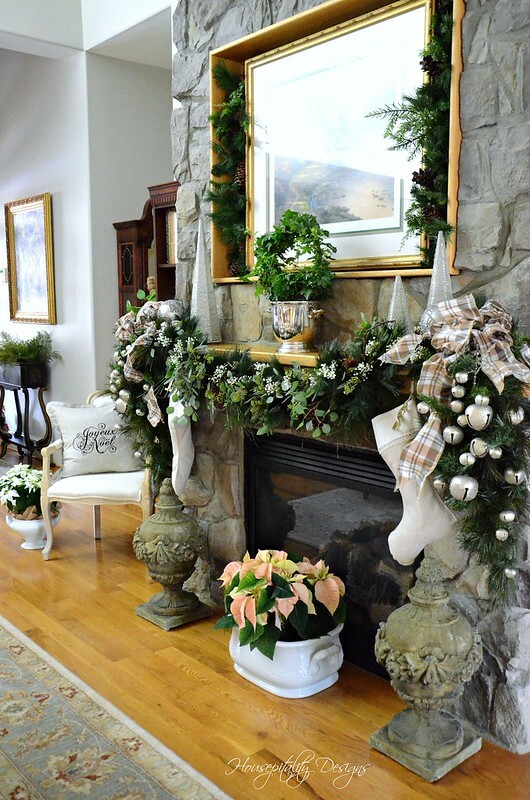 The fireplace garland is beautiful, the ribbon is to die for, loving the neutral color scheme. My favorite ornaments on my tree are all the stars adorning it. So simple yet simply elegant. Beautifully done! Your Christmas decor is absolutely lovely. As is everything in your home! I really like the silver bell ornaments. One of my mother’s favorite Christmas songs is “Silver Bells!” It would be really difficult for me to choose a favorite ornament of my own as so many of my ornaments have sentimental value. I still put the children’s homemade ornaments on my trees along with ornaments from a special shop that my daughter and I visit each year to pick out some very special (more expensive) ornaments. Christmas is my favorite time of year! My favorite ornaments are the ones my kids and grandchildren have made, can’t beat that! Shirley I have been following floral Fridays from the beginning and now I will follow Monday morning bloom so so inspirational Shirley your home and floral arrangements are stunning, girl you’ve got skills! I am thrilled to have the opportunity to win the drawing from Lynch Creek Farm. Your house and decorations are gorgeous! My favorite ornament – that’s a hard one. I have one that was on my tree when I was a child, that is certainly a favorite. And a more unusual one, a pink pacifier that was hung on my tree by my daughter 7 years ago to let me know she was expecting a baby girl! And many more special ones, but those two are probably my very favorites. Thanks! Thank you for sharing your home with us. I love the silver bells on your garland. A dear friend of mine made me a fabric Christmas Mouse ornament. I have become very fond of that little guy who appears every December. I really enjoyed seeing your decorated home. Everything is beautiful. My favorite ornament is one my children made years ago with beautiful sea shells. My personal favorite ornaments are the tongue depressor frames decorated with macaroni and spray painted silver that hold pictures of my granddaughters in preschool. I also think every Christmas should have a Nativity. Absolutely gorgeous decor in your home!! Beautiful! Favorite ornament is my little church mouse! Your decorations are beautiful! My favorite ornament is a Victorian style ball trimmed in red velvet ribbon that my mother made years ago. Shirley, your home is lovely and the perfect backdrop for the elegant wreath. The greenery is so pretty with the contrasting silver, which is a favorite of mine. My favorite Christmas ornament is one, handprinted by my daughter, 20 years ago. I always place it on a small ornament hanger, on my sideboard. 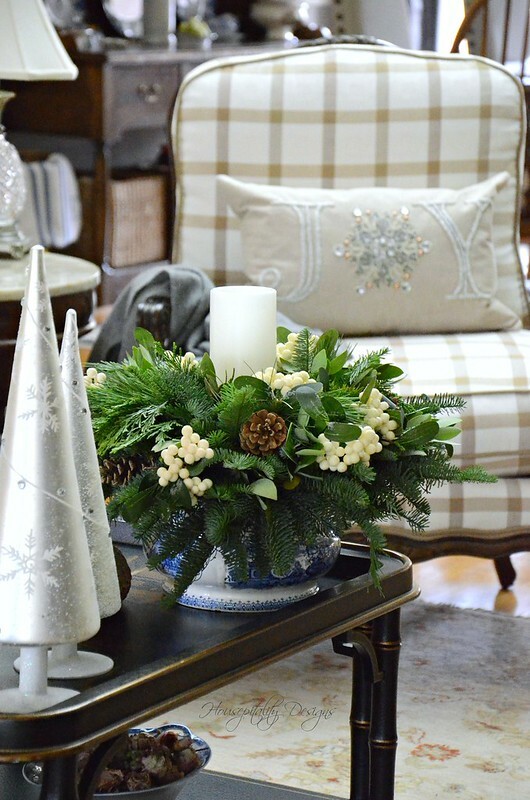 Your Christmas decorations and arrangements are absolutely beautiful!! My favorite is the arrangement you created in the blue and white bowl…..stunning!! My favorite Christmas ornaments are the ones we purchased while stationed in Okinawa, Japan. They bring back good memories year after year! Hi! I just found you and can’t believe what I’m seeing! 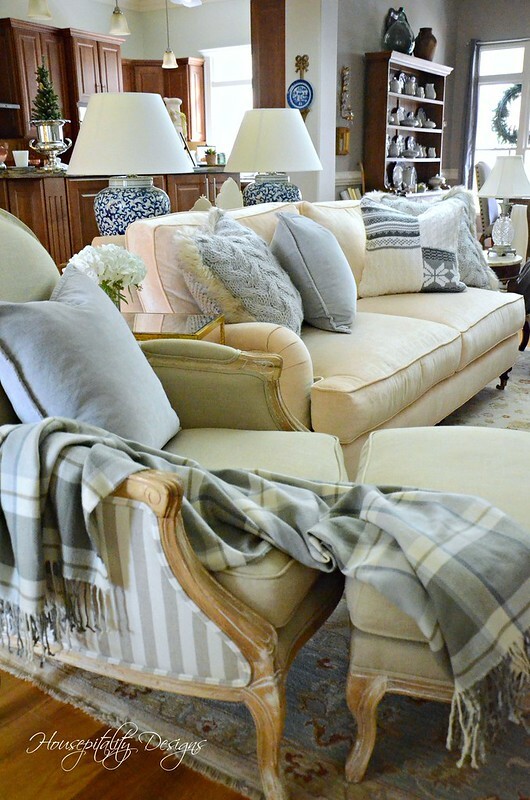 I love French Country and you do it so very beautifully! Thank you for sharing!!! Merry Christmas! My favorite ornament is actually a small silver frame that has a picture of our family from years ago… I love it more every year. Your mantel is stunning. I love how your put together your vignettes. 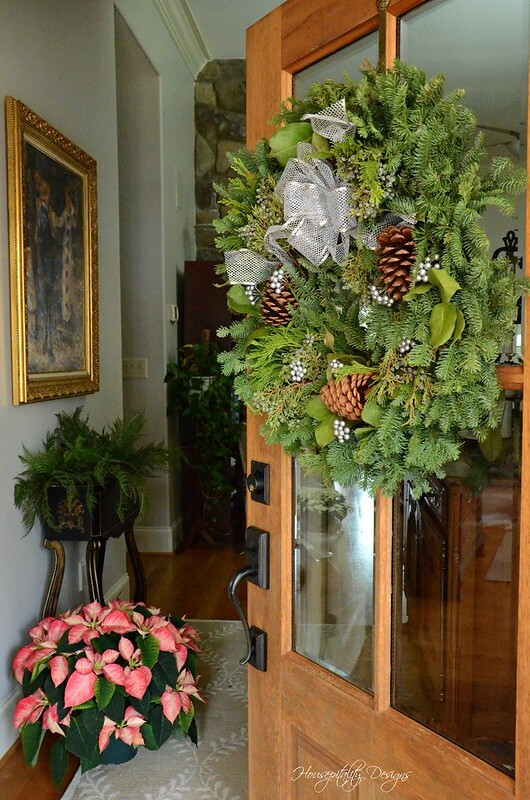 I have had wreaths from Lynch Creek Farms and they are fabulous. They do smell for a long time inside the house. I did not know about spritzing the back of the wreath every few days. Great tip. I love all my ornaments they all mean something to me but any of the beautiful angels I have collected through the years or were gifted to me are my faves. Your home is looking so pretty in such a short time too. You go girl. Love your wreath choice! That mantle is gorgeous! Some of my favorite ornaments are the little simple ones my kids made when they were very small. Shirley, your home is beautiful and can’t wait to see the home you are building after you decorate it. My favorite ornament is a Waterford ornament given to me by a sweet friend who later took her life. It is a reminder of how special friends are and how we need them in our lives. I miss her so much every year as I hang this ornament on my tree. Love your coffe table arrangement! Thanks for entering me in the giveaway! wow! so pretty! It’s hard to pick favorites from my natural theme of forest and woodland creatures but, I think I would have to pick my fox. The fox has been in our family for years, it’s a small red furry fox that fits in the palm of your hand, so precious. Merry Christmas to you all! As always, your Christmas decor is absolutely stunning and I get so much inspiration from all of your posts! It is hard for me to pick a favorite ornament because most of the ornaments on our tree are hand blown glass and most of them have some special meaning with regards to our family. The one that we get a good chuckle out of is the hand blown glass “John Deere tractor” from the Old World Ornaments. My hubby worked for the John Deere Company for over 45 years, so naturally I had to purchase the little tractor when I saw it in a Christmas shop many years ago. And, it is the one that has been replaced 3 times due to getting broken when decorating the tree. So far we are going good this year….no broken ones yet! Merry Christmas from the South Carolina coast! My favorite ornament is a small turquoise glass ball that says Merry Christmas on it from the 1950’s. It was on my parent’s tree when I was young and I have it on my tree now. Some snowflakes that my mom crocheted for me over the years before she died are very treasured as well. It’s all so gorgeous! Thank you for sharing. My favorite ornaments are the ones I bought every year for each of my children and now grandchildren. I also love the ones that came from my childhood as well! I was fortunate to be able to do a lot of traveling when I was younger and bought many heart shaped glass ornaments at European Christmas Markets. They remain my favorite ornaments all these years later.